One of the little things you learn to like about wormholes is the fact that every day, you’ll have a connection to somewhere else. Somewhere new to explore, meet the locals, and kill them. The other day was one of those days. Having asked what we should do we decided to fleet up and go on a little roam in our Null-connection. It wasn’t too fruitful, I’m pretty sure we scared off the locals, they weren’t used to meeting new people. We found a few people hanging around in space but they had a bubble around them or were on their way to somewhere else. A shame, we couldn’t catch anyone to exchange ammunition with. Luckily that changed on our way back home. Turns out the locals were setting up a little welcome party, to make sure that we knew that we were appreciated, going door to door, wanting to say hi. They were a bit off our home hole (phrasing?) so one of us decided he’d go say hi, you know, so that we could warp to him and get the party started. They had a few hurricanes, a few drakes etc etc, you know. The kind of stuff I should not be engaging with a hound. Since that was the stuff I was flying with since I only have a few hounds in our citadel. Oh, and a Proteus, I’ll get to that. Turns out the welcome party didn’t really think about keeping us there, but luckily we did think about making sure that nobody could leave the party sooner (scrams, get it? I’m making it a bit more interesting). Thus our FC decided to bring out his Proteus, because what better way to use an expensive party ship, if you can leave before it gets rowdy. This made me log on my other account and get in my Proteus too, it had been a while since I flown it, but last time I did I had fun with it. We came, we saw, we exchanged ammunition and fireworks. All in all, it was a good day. I’m looking forward to more of these. Last week, in order to put some more effort into my EvE Online carreer I joined a wormhole corporation. I’ve got some experience in wormholes and have had nothing but good memories of my time in them. Thus me finding a corporation to join that lives in a hole, wasn’t that big of a leap. NPC null is fun, but nothing beats not having local and random people to “harass” when you have a connection to their system. The one thing that’s a bit harder for wormholes, is getting your ships in them. Not only did I join a new corporation, I also got a bit more work on my plate IRL which means that I can’t just log in during the day anymore like I’ve done in the past. I’ve spent the past couple of days waiting for a good connection so I could bring in ships, because I was stuck using a Hound, which got blown up when I was trying to tackle a Drake that was obvious bait. 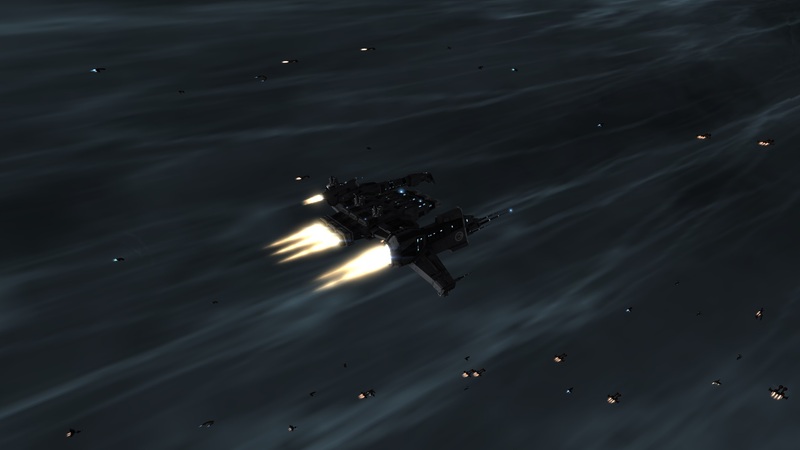 So today there was a connection close to Amarr a bit deeper down the chain, which meant that I could start flying in ships. One at a time. Yay, right? In order to make it a bit more efficient for my time I just self destructed outside the citadel everytime so I got cloned back in Amarr. I bet the guys at the clone station must have had a little bet going on how long it would take before I popped back out. Thank god for wigs. I now have a few of my own corpses in my hanger, since they were floating around the citadel and I did some cleanup, and I’m pretty sure one of them is in another corp member’s hangar. I don’t want to know what he’s going to do with it. We don’t want to go that path. Anyhow, I’m back at it! And hopefully I’ll be able to update some more again.